I don’t know how it happened really, but yesterday I started a new quilt I had no intention of making yet! When I’m working at my computer I always have a scrapbook or graph pad next to me so I can doodle or sketch ideas as they pop in my head. 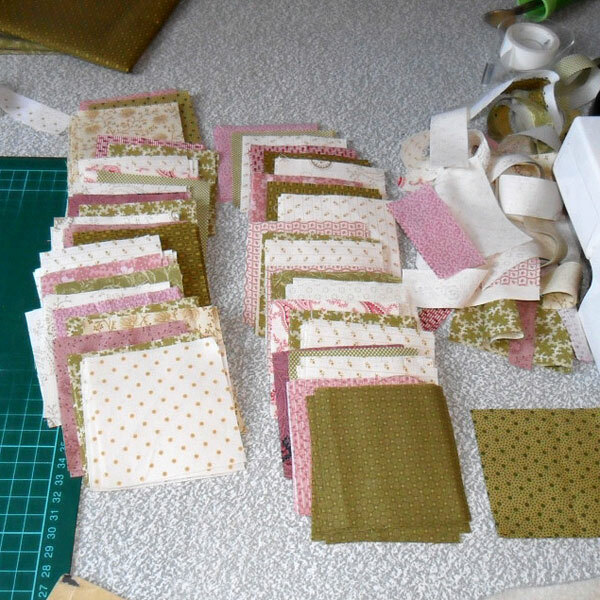 Sometimes I look at previous ideas which makes me jump up and go over to my fabrics. I’m wholly at the mercy of both the doodle and my fabric. The plain red fabric I’m using I’ve had for maybe 17 years. It’s very stiff, just like when you pick up a really old piece of Marcus Bros or Concord fabric out of your stash. 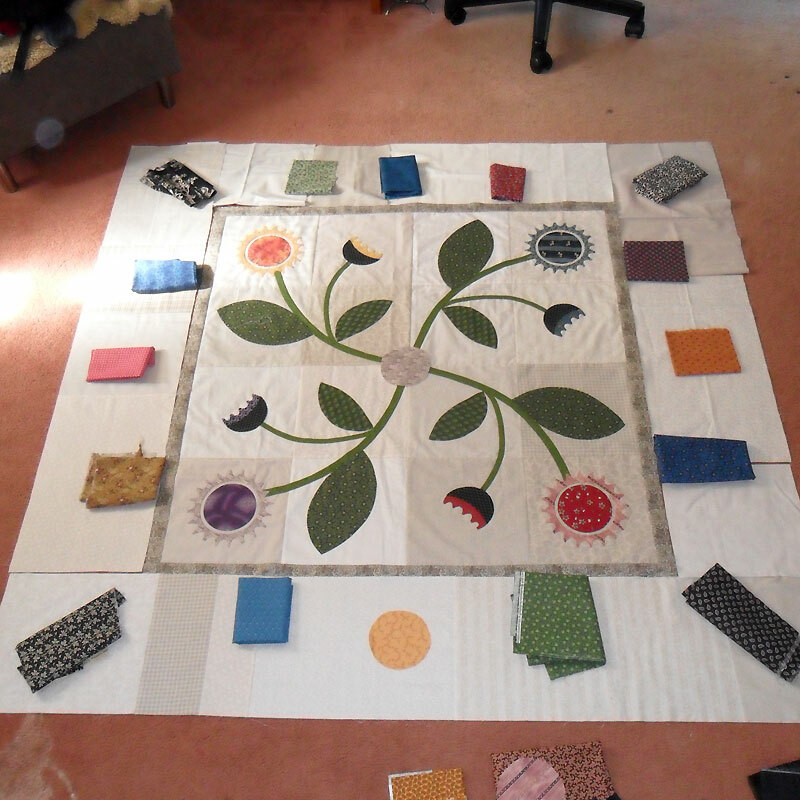 I had about a metre and a half left from an earlier project and have really designed the quilt around what I could cut from it. I had to be able to get the setting squares and claws out of it. 20 blocks done in one night! Only 28 left to go. The quilt will be on point as you can see, and I’ve decide it will be 7 x 7. I really didn’t need another half done project cluttering up my studio/office. Now if only the weather would cool down again I could get it finished. Today was 35C with a hot northerly wind which where we live is bushfire weather. I’m really envying those of you in the northern hemisphere right now. Here’s looking forward to Tuesday. to everyone who chimed in to help find this fabric. I’ve got a few metres on order now. While I probably only need a metre or two, I’ve decided to get four, as well as some other treats. Unfortunately for my purse, it was an Australian store so that meant Australian dollars, more expensive than US even on special, but I do try to buy from local patchwork stores and only buy O/S if I can’t get it locally. 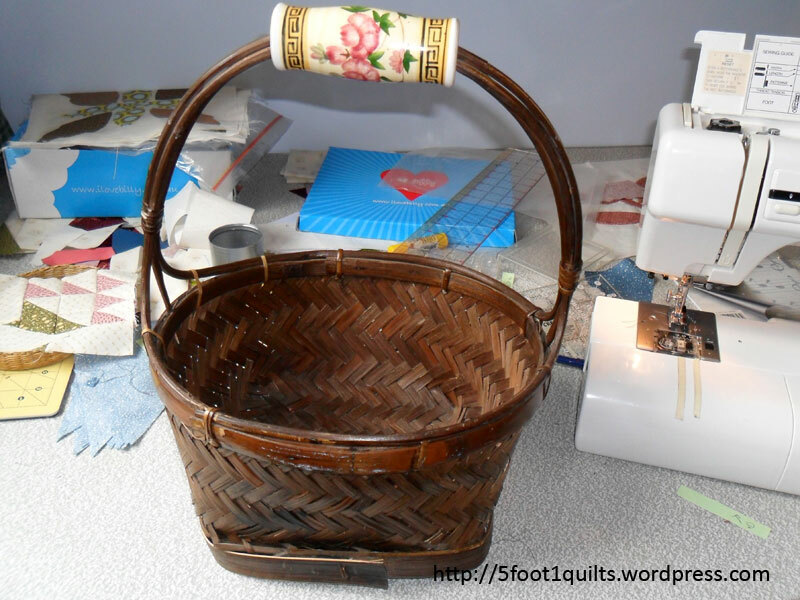 I’m busy finally finishing off the dogtooth borders of my basket quilt. I started them ages ago, had 2 and half done and then just stopped. I blame the weather, we did have a few warm days. I’ve used the freezer-paper foundation method so while they are very accurate they certainly take longer to do. So today I’m going to finish them no matter what and then it’s back to the office to do some maintenance on a few websites, as well as start another site for a new client. 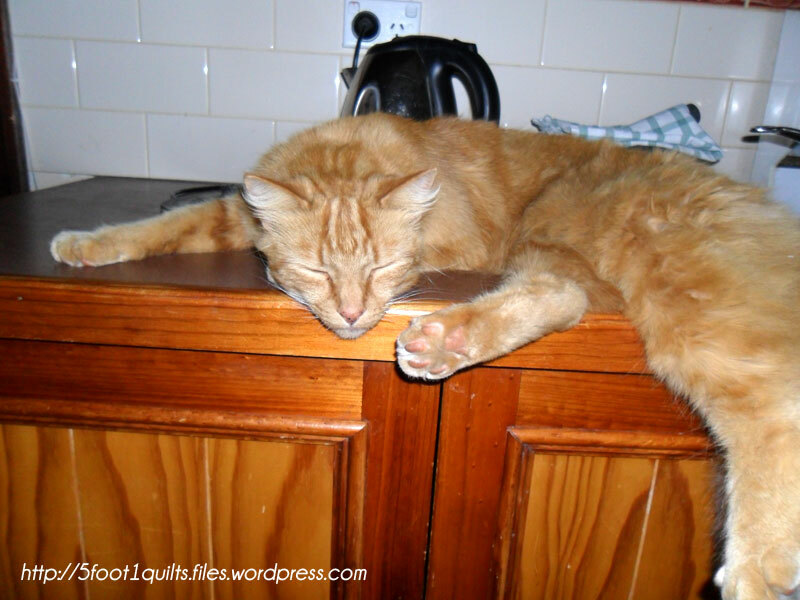 That will mean no sewing during the day and no blogging or quilt blog reading! Well back to the ironing board as it were. A busy start . . .
to 2012. The unseasonably cool weather we’ve been having in Victoria has enabled me to spend some time in my studio, and so far in the first 2 weeks I’ve sent 4 quilts off to Margaret to be quilted. I’ll post some photos of them when I get them back. I’ve also organised the binding for a quilt I finished back in July and just folded up and put in the cupboard. It’s a lovely little quilt and when I took it off to Margaret to get quilted we noticed I’d left a petal off it so rather that take it home I said ‘just quilt it’ and so Margaret quilted in the lost petal. The quilted-in petal is in the top left. 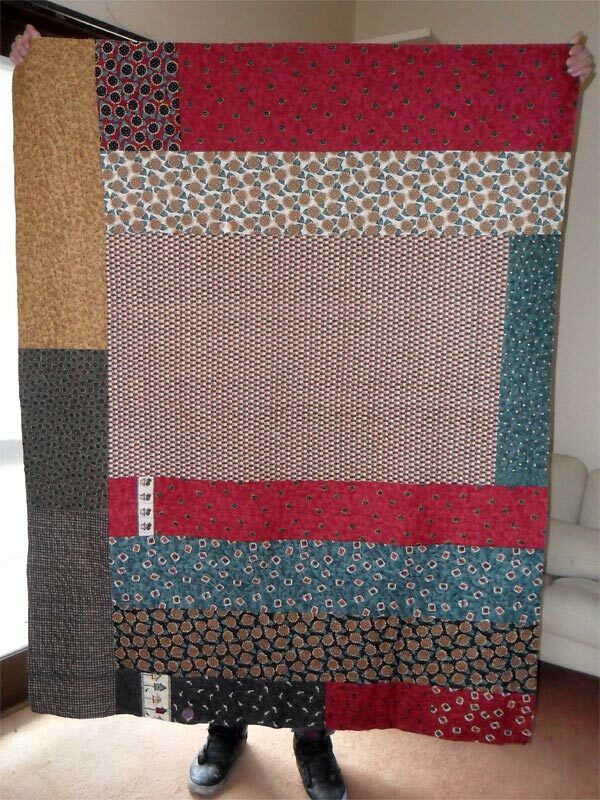 I need to sew on 4 little red circles as well as think of a name for this quilt. 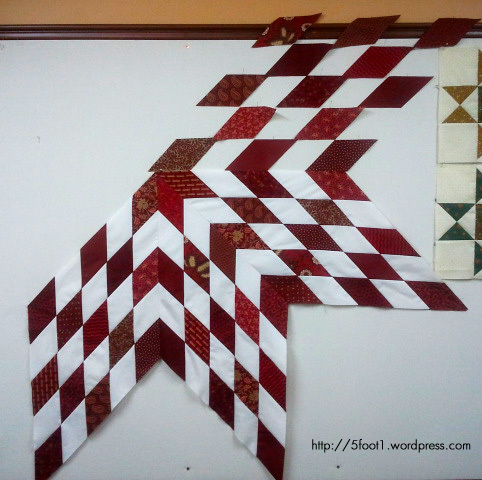 Next is my red & white star quilt, the one in the header. 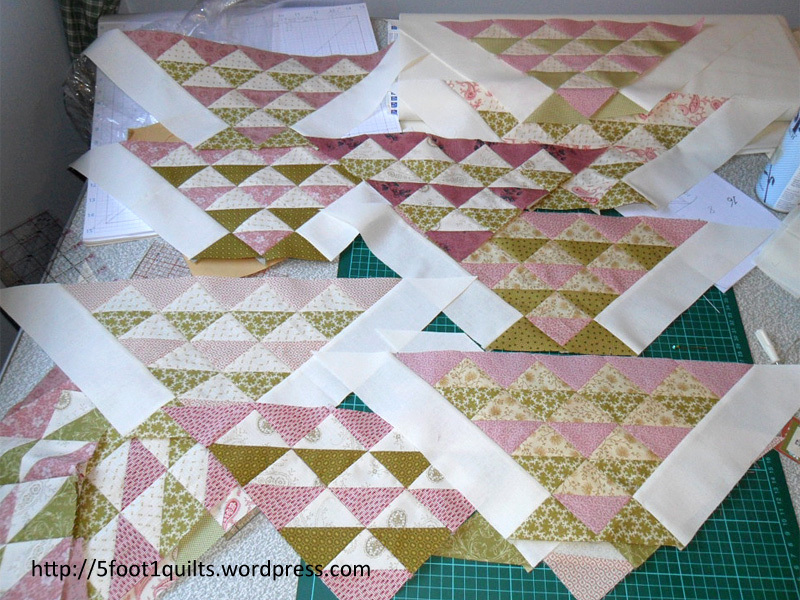 I’ve finished the centre and attached the setting squares and triangles a little while ago. Yesterday I took it out again and decided I want to add a little border made up of the left over red diamonds cut into triangles. I’ve already got the backing so I hope to get it finished by the end of the week and drop it off to Margaret. Just about every quilt is at the machine piecing stage except for the borders of my Sunflowers & Willows quilt. Here’s a look at one of the borders which still needs the frill around the circle to be done as well as the appliqued edge. I’m sort of saving the applique for sewing under the air-conditioner when we finally get really hot weather, which we will! February & March are always hot. I'm missing my frilly bits! 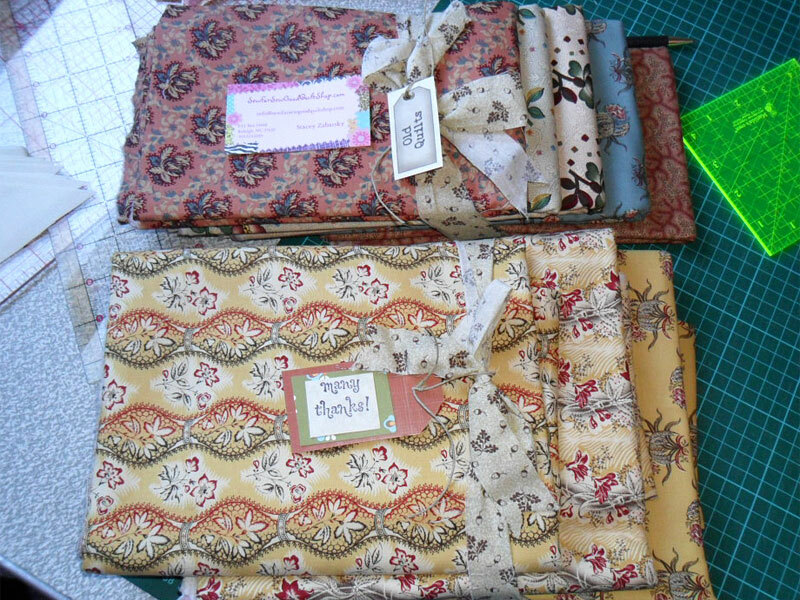 Once I’ve got all these done I can start my new basket quilt in the Kaffe Fassett fabrics I bought back in December. I’ve already cut out 16 baskets, prepped and ready to. Well it’s time to stock up on some essential shopping and I leave you with a piccy of my very naughty cat, Charlie. to turn a quilt top into a quilt. Until a top is quilted, it’s just a top. The other day I picked up my very first, rotary cut, machine pieced quilt top from Margaret. It’s journey had spanned 17+ years, and too many homes to count as a top. A few weeks ago I found it in a scrunched up ball sitting in a small paper waste bin and decided it was time to give it a purpose. That’s my eldest son, now 20+, holding up the quilt for me to take a quick piccy, and he used to use this top as part of his cubby building in the lounge. So what to back it with? I knew I wasn’t going to spend money buying backing fabric, so I dug out some fabrics I had decided to donate and pieced them into a backing. When Margaret saw the backing, well, words failed her! The back is made from fabric that nowadays I wouldn’t buy in a pink fit. The scary thing was I had enough to actually make a backing. Well so much for me being a Repro Girl! But looking at the front of the quilt is fun. 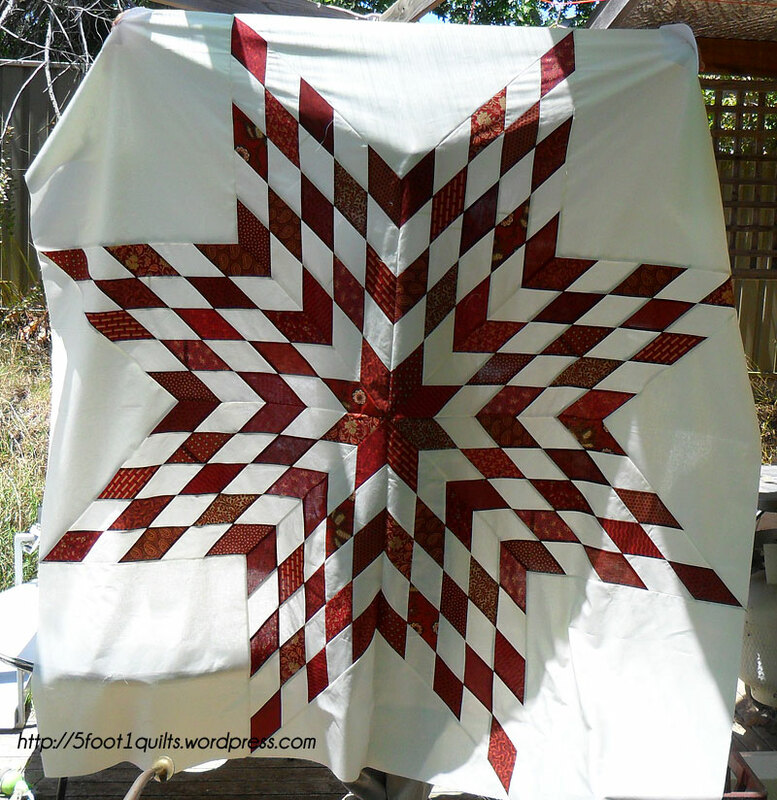 I loved those Red Wagon Plaids, and recently used some to piece some Ohio Stars for my Chilli & Chocolate quilt. 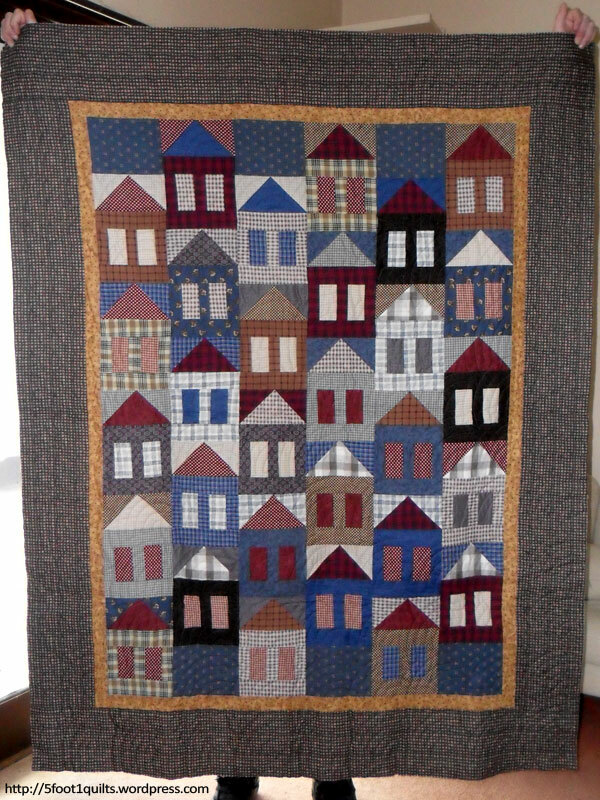 This quilt is a little bit of a quilt fabric history tour of the mid 1990s. 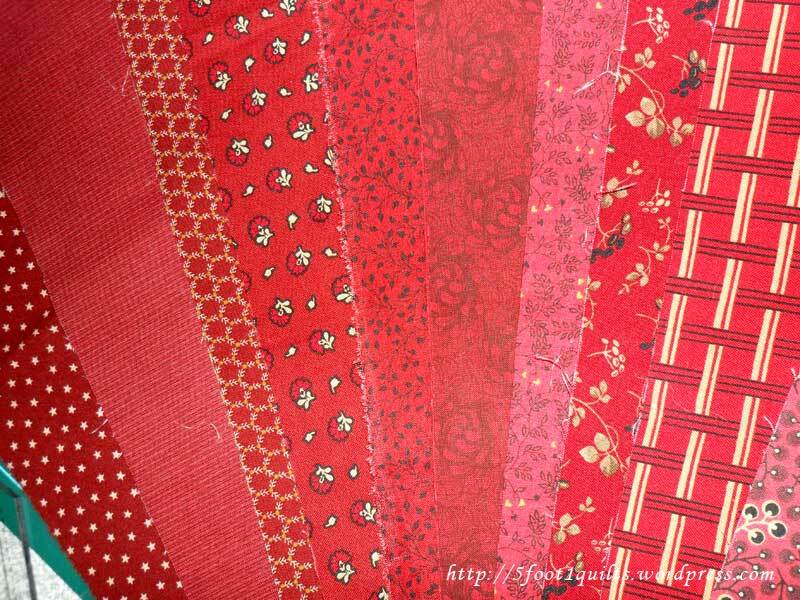 So I’ll make a label with the quilts story, attach it and bind the quilt in a nice red I think. And thankyou Margaret for quilting it and turning it into an actual quilt. 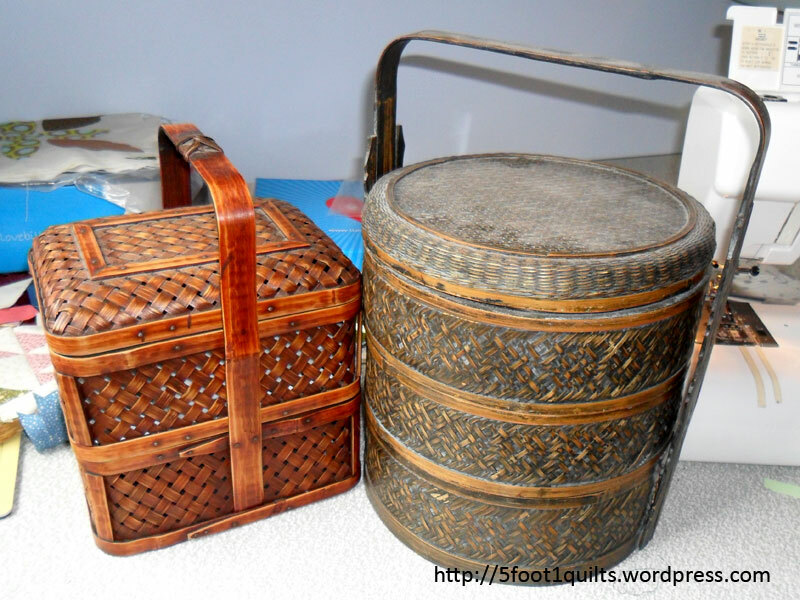 ps WordPress just told me this is my 50th post! 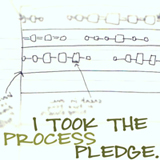 My biggest problem is actually staying on one project. In February I started designing another quilt based on a block in an antique quilt. 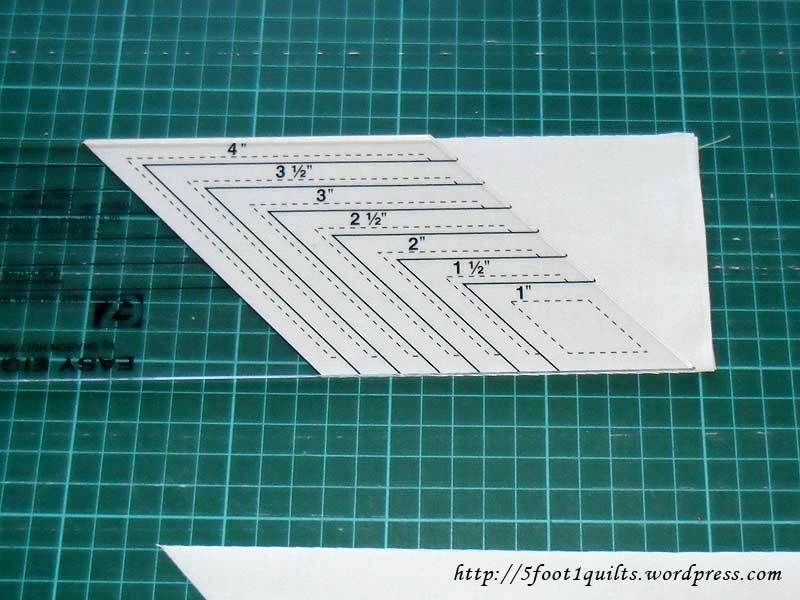 While I really do love hand-sewing this particular block will have to be machine appliquéd if I ever want it made. 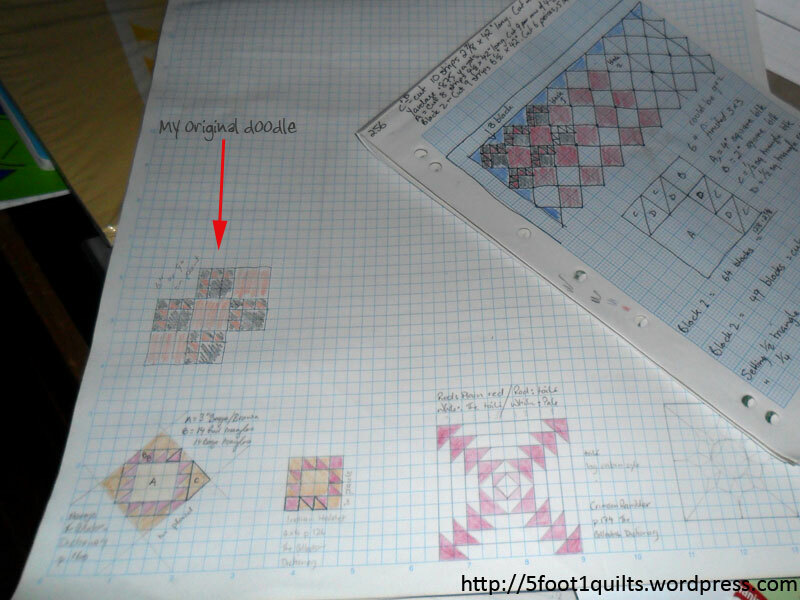 As I don’t have EQ or any Patchwork or Quilting software I usually design quilts either the old fashioned way, with pen & paper or I use Adobe PhotoShop or Illustrator. 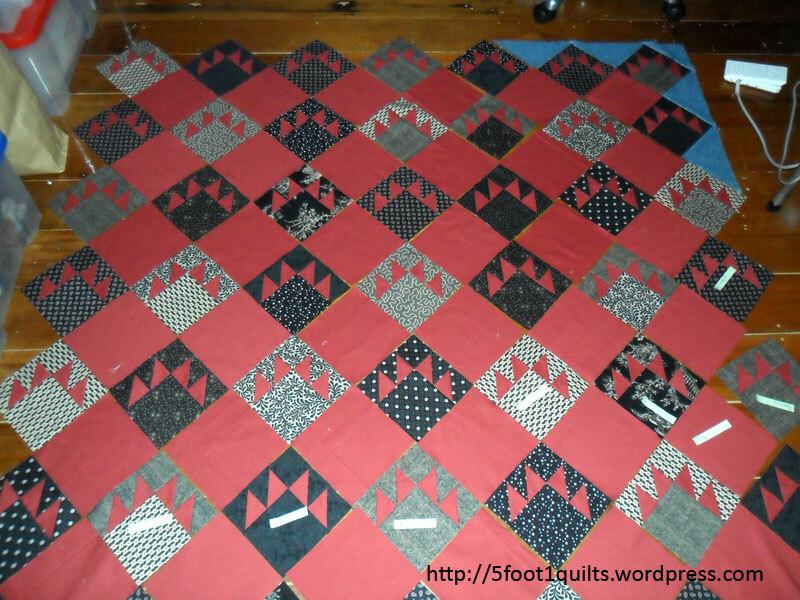 For this new quilt the blocks will be 34 inches with approximately a 15″ border, maybe. 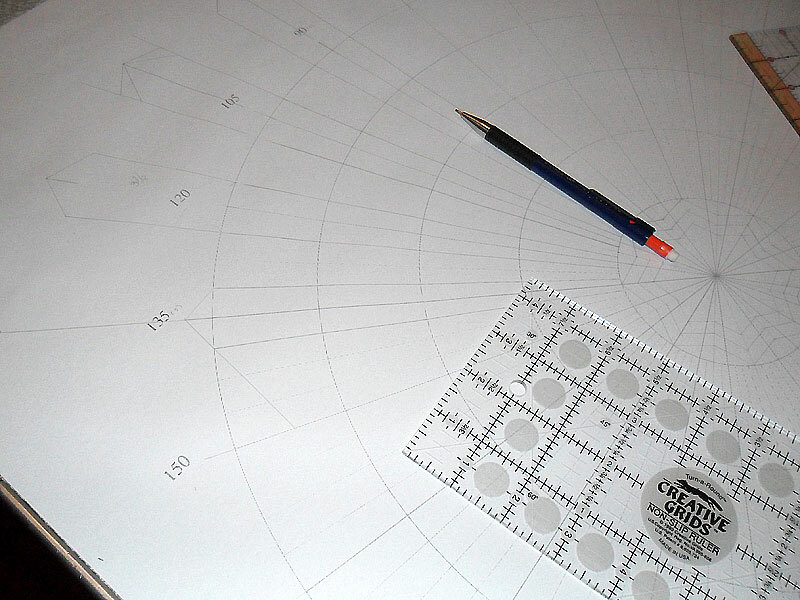 I had this idea on the back-burner until I saw a link to this wonderful graph paper by Incompetech.com on another blog. It just makes evenly dividing a circle a breeze. I printed it out at A3 size and took it off to the copy shop where they enlarged it up to A1. This will be take two for this pattern. Originally I printed it out at A4, drafted it up and then took it to the copy shop. Starting at A4 size was really a silly mistake so next time I would just ask the copy shop to enlarge the grid to A1 or A0 and go from there. I’ve lengthened the spokes quite a few times to get the look I want but it still isn’t quite right. I’ve chosen 24 spokes for this design, but perhaps I should have put in another lot of three spokes which might give me the look I’m after. 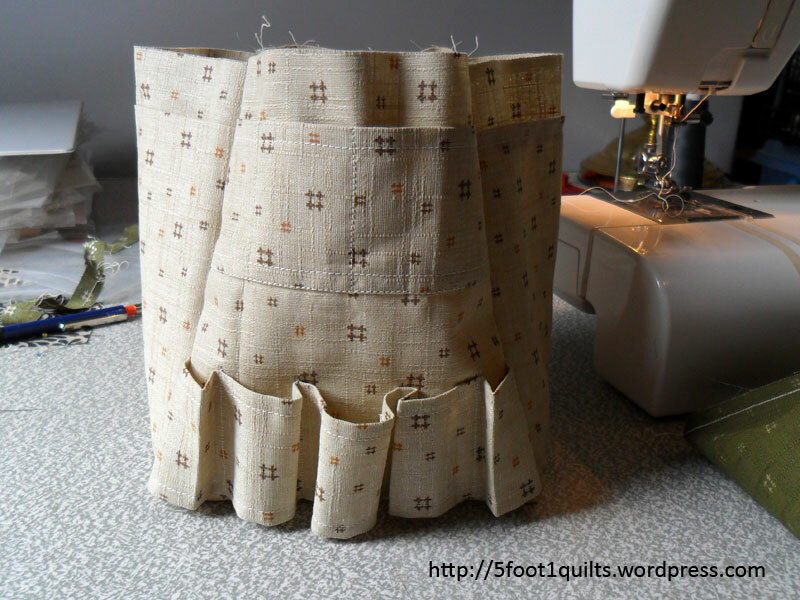 I have a second pattern in mind using four fabrics and slightly altered length of spokes for a windmill effect. 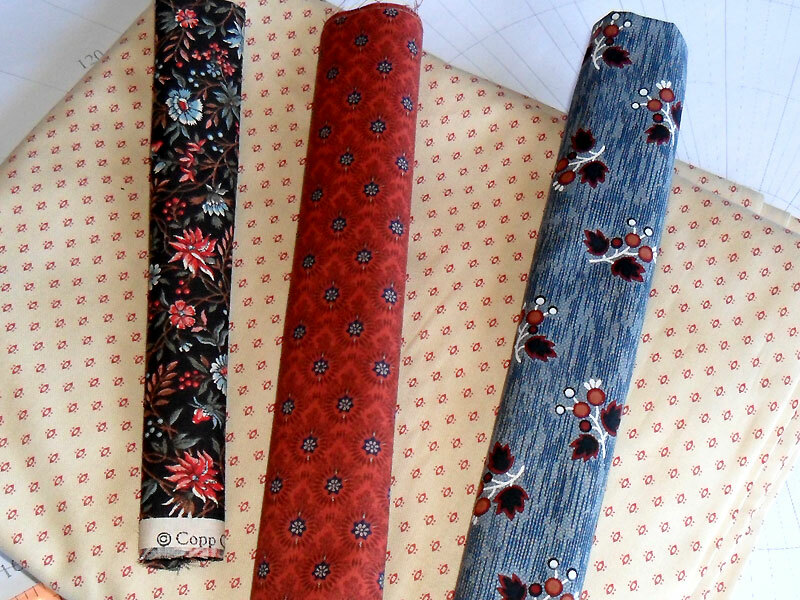 Anyway having chosen 3 fabrics I’ll get 8 repeats of each. 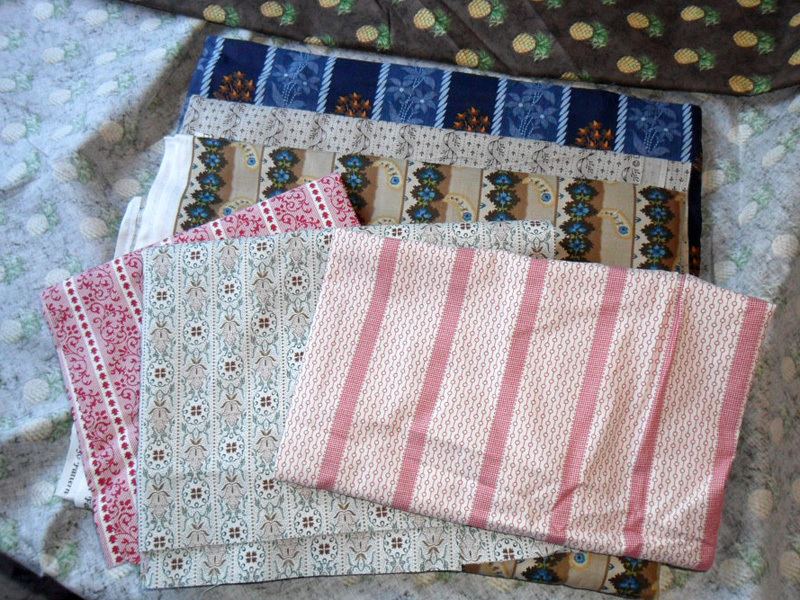 Two of these fabrics are from my Smithsonian stash and the medium blue is a Pat Speth Village Charm. All together they looked very muted, rather dull really, so I asked Margaret if she could help me find the right background. When she picked up this fabric she immediately said, there a fair chance that will be disregarded straight away, but when I put the other fabrics on it they all just popped. Margaret is so fabulous at picking fabrics, I call her my colour consultant. Mind you I’d only chosen the terracotta & medium blue and Rachel, picked the dark blue floral from my stash. So Rachel and Margaret have really contributed. 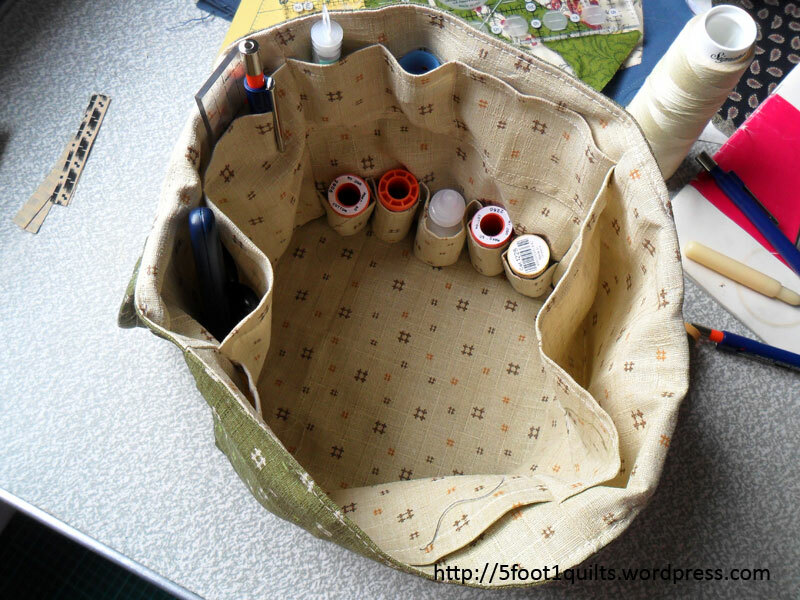 Also floating in the back of my mind is the same pattern but with modern quilt fabrics. I can imagine it in Kaffe Fassett fabrics on a dark background or some really bright fabrics on a light background. I’ve promised myself that this year I’m going to make a modern quilt. I’m not working or studying tomorrow so I’ll actually be able to do some sewing. So I hope to do at least 2 points of my red & white star quilt. 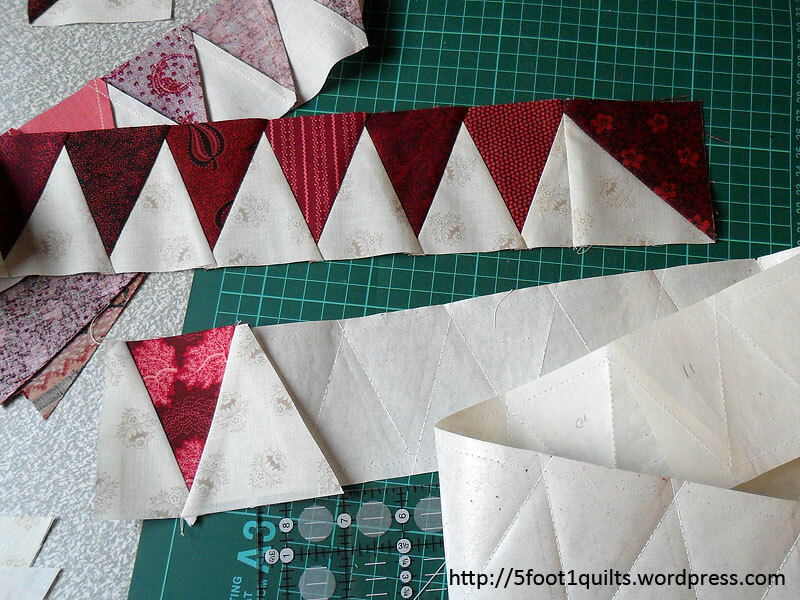 With all the photos popping up in blogs of the Red & White Quilt exhibition its keeping me keen to finish the quilt as quickly as I can and after my star I’ve got on other quilt top which entails four seams and that top is done. I’ve been sewing a bit since my last post and last night was 4 til 10, or in my case 6.30 til 10. 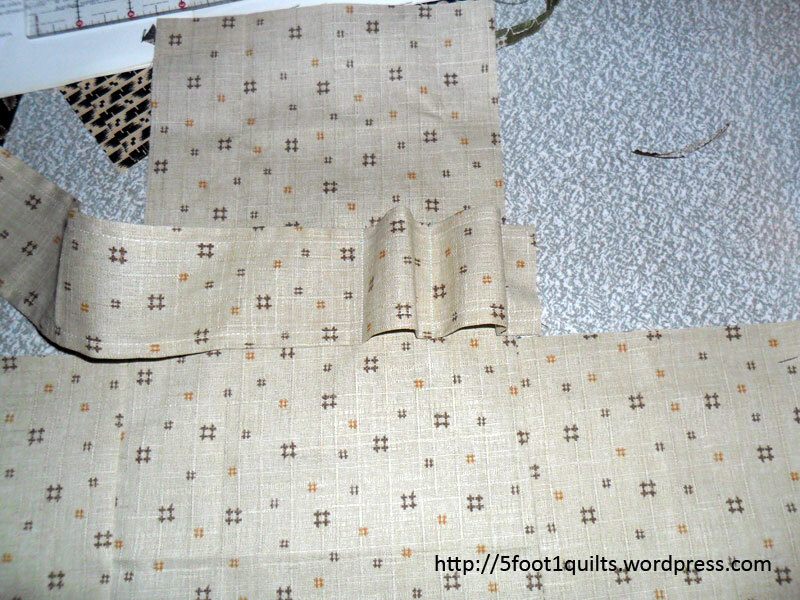 Normally I only take hand-sewing when I go out, however I took my sewing machine along and pieced one point completely and sewed the strips for another. Now that’s not really much of an accomplishment as piecing the stripes only takes a leisurely 15 minutes and another 10 to sew the strips together. One of the lovely things about this group is we all jump in with suggestions when someone brings along a new project. Rachel was in fine form and giving me heaps, in fact nearly all the girls were. Cheeky beggars! So I made Rachel, with Ellie’s help chose the placement of fabrics for the next point. That point is nearly finished so that will be half the star done. I’m teenager free this weekend so after I do a little housework its off to the sewing room and just maybe I’ll get the rest of those points finished. As I didn’t have a camera with me Rachel took a photo with her phone so here’s a progress photo. I’m intending this to be a very simple quilt but if you have any suggestions as to what to do with the setting squares and triangles I’d love to hear them. In my last post I mentioned I’d started a new job which was keeping me away from stitching and as it turns out, a lot of things actually. Well as it’s a temp job I’m looking forward to it ending in 2 weeks. This job has meant a lot of commuting, a very messy house and no sewing due to sore hands. 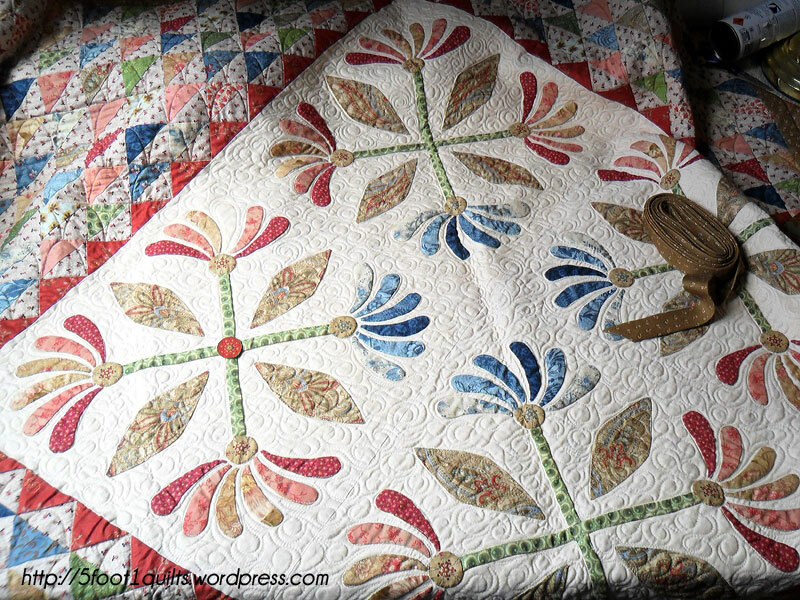 Anyway to quilty things, I’ve really been enjoying Taryn’s online exhibition of Red & White quilts which is particularly fabulous for those of us who have no chance whatsoever of getting to the real thing. One of the quilts that caught my eye was 35 or 44 the quilt that both Sue and Mary Jenkins posted. Looking carefully at the photos I’m certain its the same quilt. It so inspired me that I decided I would pull out my assorted reds and only buying the neutral fabric would start a large red & white star quilt. Now I’m simply not disciplined enough to use one plain red, it’s just never going to happen so I chose approximately 13 fabrics and decided to show Margaret while I was visiting and she was so enthused she generously contributed some beautiful fabrics to my quilt. So the reds are all cut out as is most of the neutral. 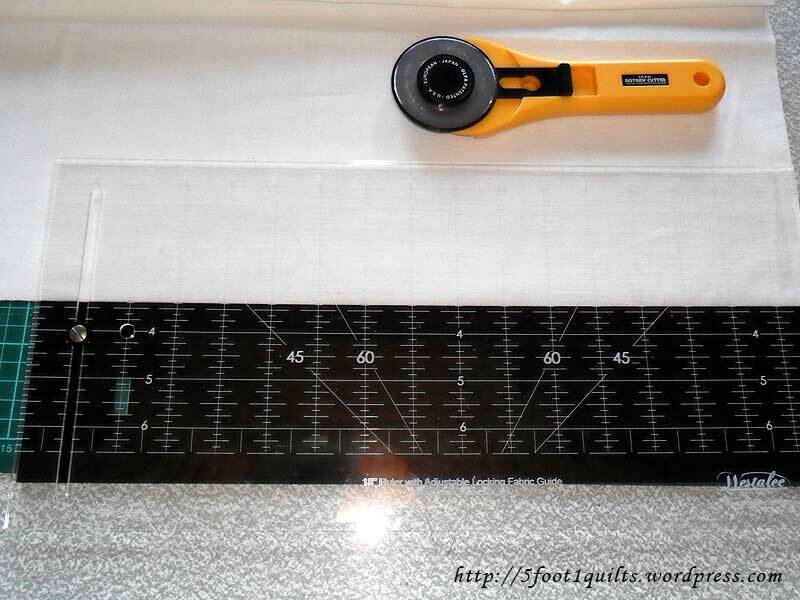 I also used my new Westalee ruler I bought late last year as well as my Easy Eight ruler. I’m about to go off to do some sewing but I’ll leave you with a little taster of what I’m doing. 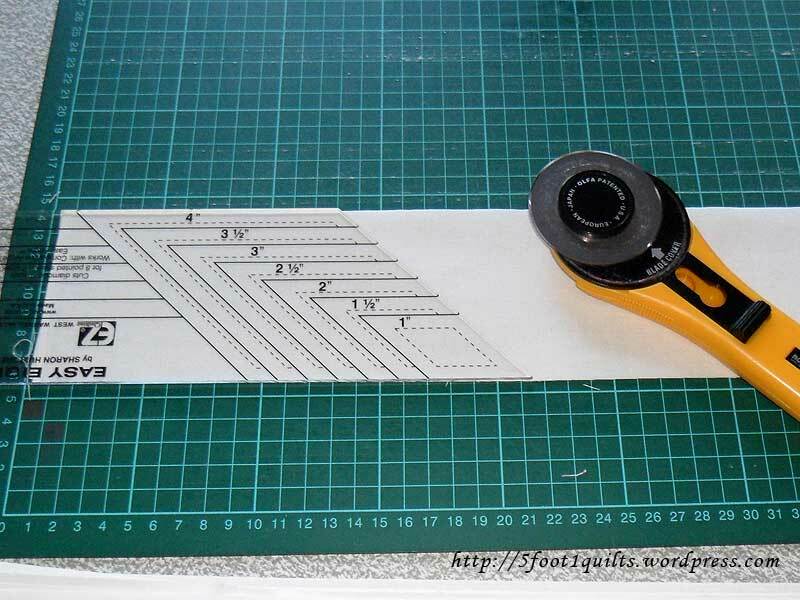 Ages ago I pledged to mention/blog about My Process so here’s me using my Westalee ruler for the first time, and I’m really pleased I bought it as it made cutting these strips much easier, particularly as they were an odd width. 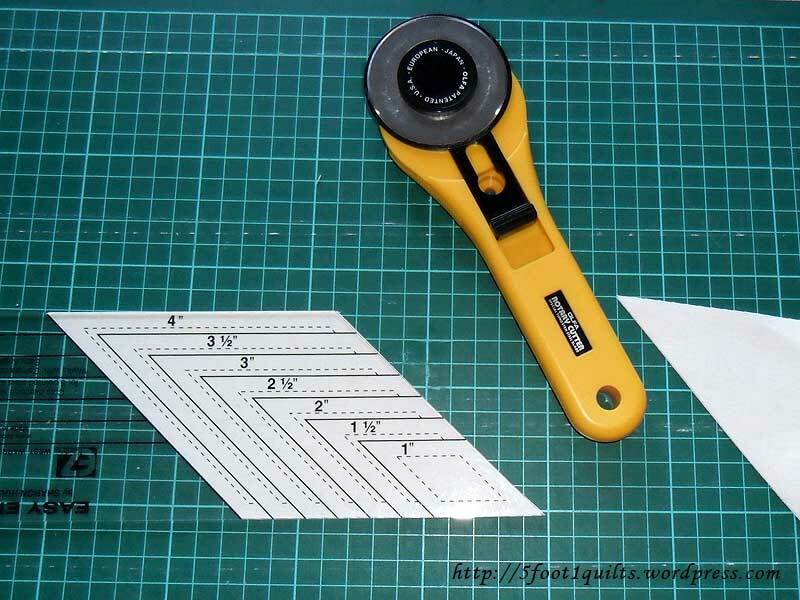 And here’s a step by step of the Easy Eight ruler in action, particularly if you have never used one. 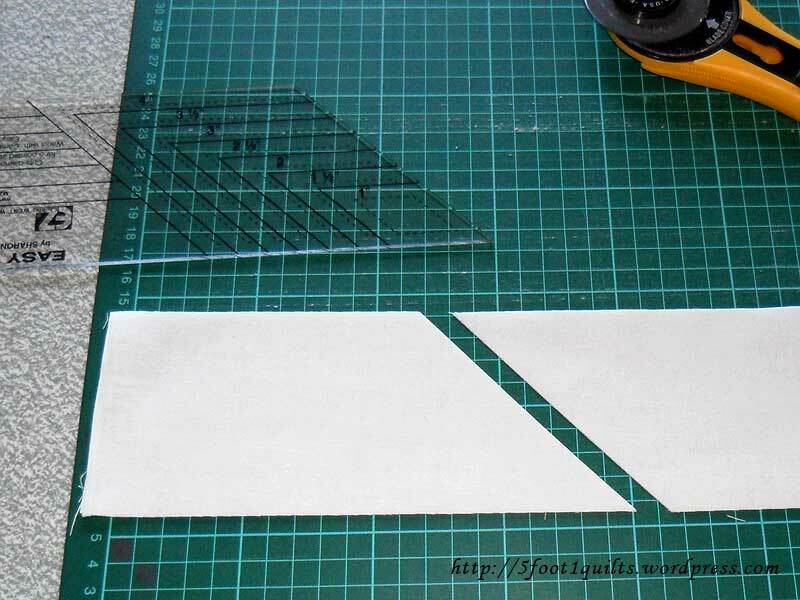 The first diamond requires a little more effort but after that its back to your strip of fabric and one cut after another produces a perfect diamond for your project. And waiting to be sewn together is the first section of my star. The beginnings of my red & white star quilt. ciao for now, hopefully I’ll blog a little more regularly as soon as I finish this job in the city. Last night I attended the opening of our Goldfield Quilters Exhibition which was a lot of fun. I’ve only recently joined so it was a first for me. The standard of quilts was extremely high and all the winners of the categories happened to be in the 4-10 quilting group that I’m part of at my LQS, Threadbear, in Castlemaine. Rachel, who makes the most divine cakes and desserts for our group, won the ‘First time exhibitor’ award for her star quilt. Once again I had no camera, but I’m sure she’ll put up a photo of her quilt. 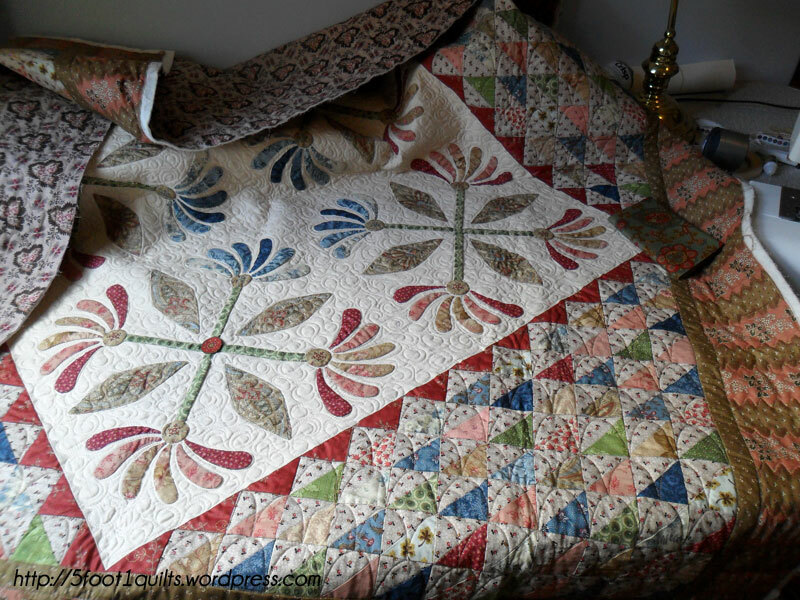 Her quilt is just eye-catching, a simple and elegant star quilt. And Margaret, did a beautiful job quilting it. 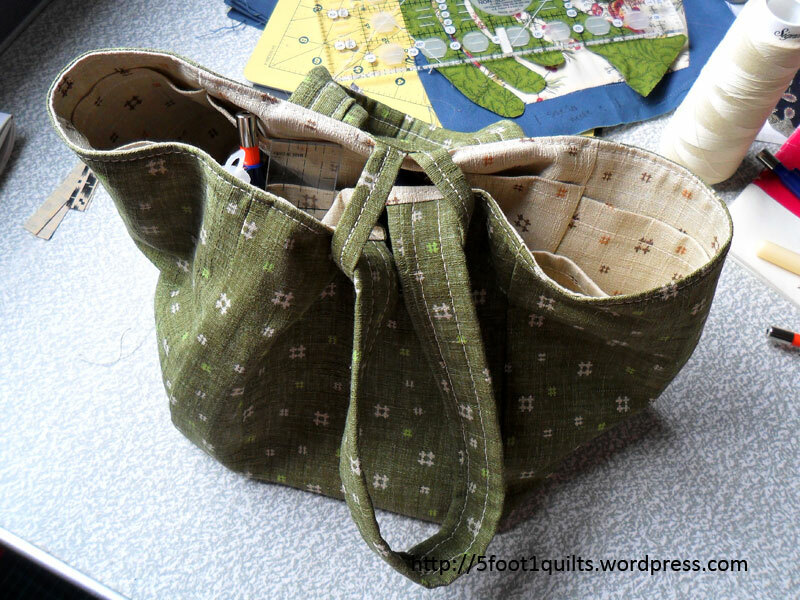 In getting ready for the exhibition I needed to frequently go to quilt shops and my purse is starting to look lean because of it. 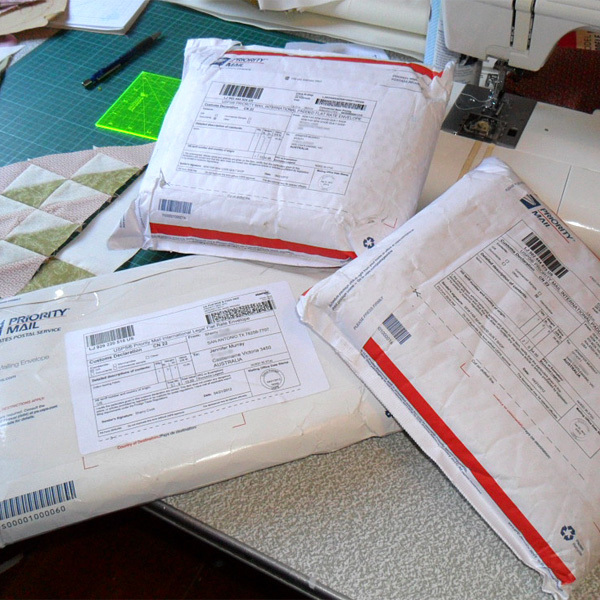 Perhaps I should rename this month ‘The month of buying too much fabric’. I’ve picked up some more Smithsonian fabric to fill some gaps in my collection, and I’ll eventually blog about those fabrics. Some repros of the Smithsonian’s that I’ve mentioned previously. While looking for the printable fabric for my labels I ended up buying fabric I didn’t need but absolutely had to have. I console myself with the fact that some of it was half-price. 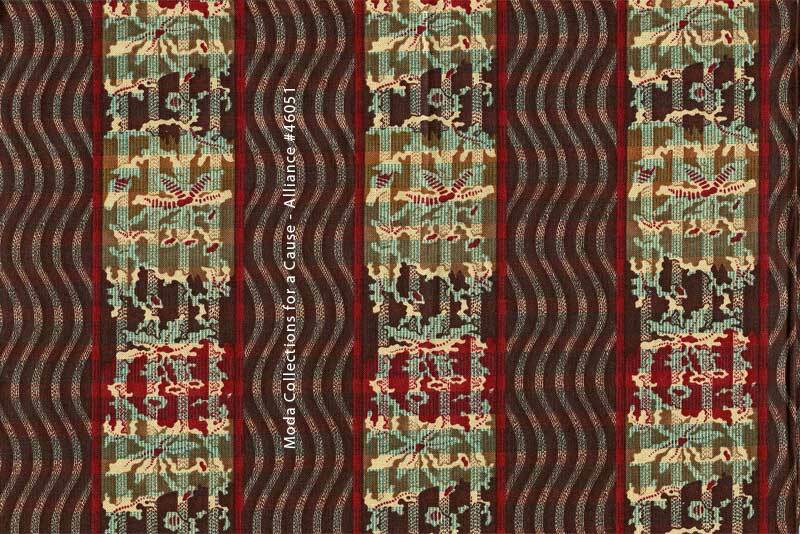 At the same time I picked up this next fabric, a stripey serpentine print, in a crimson, blue and winey brown colour. I have no plans for it yet but just had to have it. It’s been such a busy month that Margaret and I haven’t found any time to attend to our new collaboration, What fabric is that, but we’re hoping next weekend we can get back to it. It’s a bit like a new child we’ve abandoned, but not for too much longer! Lastly, remember to visit Quilts in the Barn to check out the photos of last weeks exhibition as Linda is updating regularly and take a copy of the ‘Quilters around the world Supporting Breast Cancer’ button to put on your blog.